Following the recent partnership between Airbus and Bombardier on the C Series aircraft programme, the French plane manufacturer has announced the rebranding of two C Series jets. 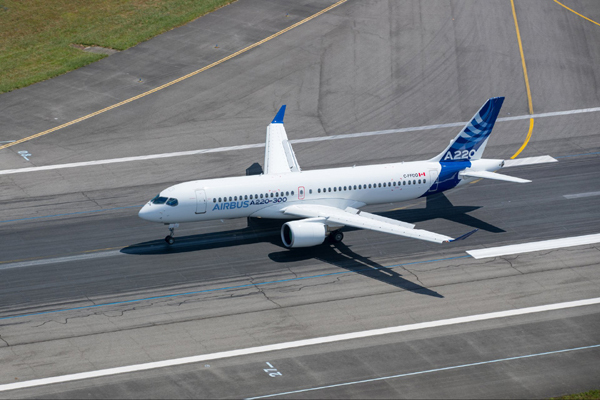 The Bombardier CS100 and CS300 have been added to the A220 family as A220-100 and A220-300. Airbus revealed the A220 at a ceremony held at its Henri-Ziegler Delivery Centre, near Toulouse. The A220-300 landed directly from the painting at 12:25am CEST wearing its new Airbus name and livery. “Everyone at Airbus has been looking forward to this historic moment. We are thrilled to welcome the A220 to the Airbus family and are honoured to see it wearing its new Airbus colours for the first time,” said Guillaume Faury, Airbus president commercial aircraft, who also thanked the staff at Bombardier and the supply chain who have worked on the aircraft over the past years. "The A220 now enters a new phase in its career with all Airbus’ resources behind it to further its commercial success worldwide," he said. The A220 family comprises two models, the A220-100 and A220-300, which are fully optimised for the 100 to 150 seat market and perfectly complement Airbus’ existing best-selling A320neo family.